Good to know. I was starting to think the owners were just gonna let it die. So they're getting a new app created? Wouldn't it be easier to just use an existing app, and set it up to work with TMS? Don't know their process for the creating/designing/modifying the proposed "new app" . . . .
Why not just use Tapatalk like all the other Vbulletin forums instead of having a separate app created? Seems it would be a lot easier and more streamlined, and one less app taking up memory on our devices. After looking at it, Tapatalk would probably be my preference as well. Not so much because I have a preference for tapatalk, but because I fear they'll just find someone to make an app and then leave it unsupported again. Tapatalk would be a whole different company that would no doubt charge for the services. I just checked it out and it's just a plug in to add to the forum software and from what I can tell it's free. 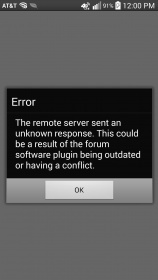 When I launch the Android app now, I get "remote server sent an unknown response." It basically won't do anything else, but notifications are somehow still working. Any ideas? Same thing for me. It's been weeks now. Why not just go back a version, when it actually worked? There is a new app being developed . . . at a bit faster rate given the circumstances, and a soft timetable has been set at about 3-4 weeks. We were awaiting to hear confirmation on a set date before posting, but awareness never hurts . . .
Do you know if there is going to be a new ios app too, since that also doesn't work to well? Last edited by mustangfan410; 8/25/14 at 06:02 PM. Update on the App and Gallery Issues . . .
That's good news. Since the android app is completely dead, I'm guessing that first quote was only referring to the iOS app? Anyone else get an update to the Android app today? I downloaded it, but the issues remain. Good to see a new app is in the works. I updated, and the android app is still completely dead. I suspect they only fixed the iOS app. I don't expect the app to ever work again until they release the new one. I just updated the Android app and still get the same error too. There hasnt been an update for the ios app yet, I thought it might have been a forum issue and nat an app issue. And nope. Still doesn't work. iOS app user. Does anyone know of another mustang forum with a working app? I like tms but I get bored between classes and need something to waste time on till the app can be fixed. You can check out 'Mustang Evolution', if you haven't already. App works great. nice to see they are taking their sweet time on getting this fixed or a new app made...smh. Been going on there a lot more. Met a few guys on a cruise this weekend, great time.